Prominent & Leading Manufacturer from Pune, we offer mild steel locker. It’s the sincere hard work of our competent professionals that we have been able to manufacture and supply a comprehensive array of high-grade of Mild Steel Locker. Our team of adroit professionals has manufactured the offered range of lockers using high-quality mild steel, which is procured from the authorized vendors of the market. 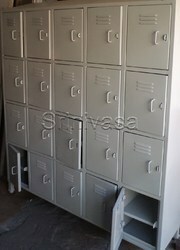 These Mild Steel Lockers are commonly used in the various offices and hospitals to keep the track record of all important files and documents.